Broadway and Amsterdam Avenue between West 73rd Street and West 72nd Street on the Upper West Side. Verdi Square is a small triangular shaped piece of land with the Giuseppe Verdi statue (opera singer) enclosed by fencing on the Upper West Side of Manhattan. In the early 1900s the square served as a gathering place for musicians, including Enrico Caruso, Arturo Toscanini and Igor Stravinsky. In 1974, Verdi Square was designated a Scenic Landmark by the Landmarks Preservation Commission, one of only nine public parks to receive this distinction. When I first moved to the Upper West Side, it was filled with drug dealers and locals gave it the nick name "Needle Park". The monument was restored in 1997 with funds from the Broadway/72nd Associates. Today, Verdi Square is entirely redecorated and landscaped, filled with baby strollers making it one of the most desirable areas of New York City to live in. On the north it is enclosed by the Florentine Renaissance palazzo of the Apple Bank Building the trapezoidal structure, with a vast vaulted Roman banking hall 65 feet high was built in 1926–28. The building now has 29 residential condominiums over the building's top four floors. Large lofts, 2 bedroom to 4 bedrooms ranging in price from $2million to $7million. 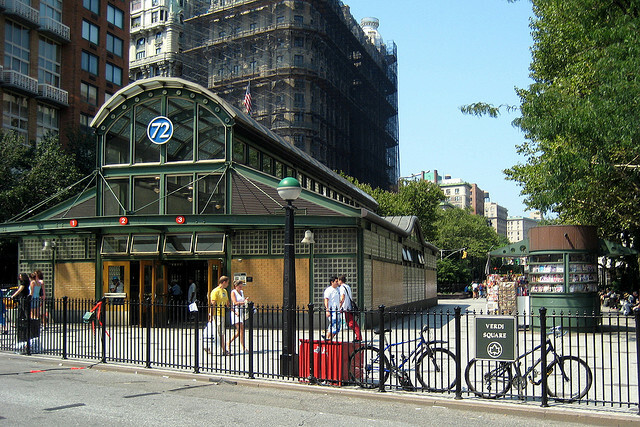 The 72nd and Broadway Subway station is located at Verdi Square across the street from The Ansonia. 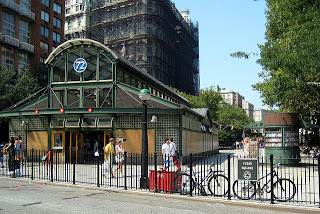 The old station head house is still there and still open on the south side of 72nd street. Verdi Square Park has mini gardens, benches and serves as a walkway for pedestrians, people walking their dogs or taking the 1, 2, or 3 trains at the 72nd Street Station.